The Chrysler Pacifica is a stylish family minivan that is ready to take you and your passengers to your destination safely and comfortably. At Dodge City Chrysler Dodge Jeep Ram, we can show you all of the different features that make this vehicle stand out from the crowd. Whether you're driving the soccer team across Saskatoon or need to get a large load of groceries, the Chrysler Pacifica is ready. When you're concerned about style, you can get the 17-inch wheels upgraded to a 20-inch set. You can also upgrade the lighting system to HID headlamps that will make it easier to see in any lighting conditions. 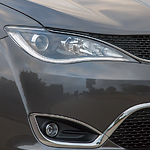 Choose daytime running lamps to add to the visibility of your vehicle. For your passengers, the Chrysler Pacifica comes with a tri-pane panoramic sunroof. You'll be able to open and close the panels with a simple push of a button.